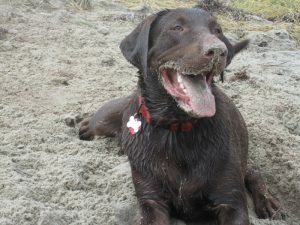 You’d never guess that my chocolate lab Niles is 8yo. He’s a puppy at heart and no day would be complete without coming home from work and hearing about his latest mischievous hijinks. 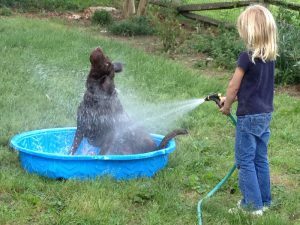 He loves to jump the fence in order to come say hello in the driveway when I pull in from work and, on a hot summer’s day, has been known to lay down in his dry paddle pool and wait for you to turn the hose on him. He’s a water dog at heart and has been known to have to literally be pulled out of the Pamlico Sound. He is incredibly adaptable and has been through a very tough year. Last May my husband and I joyfully welcomed our twins at Georgetown in DC. When we brought them home from the hospital a few days later, Niles’ world changed. He went from being the very center of our attention to being on the back burner. He weathered the first several weeks like a champ, being patient with the twins and with us as we struggled to keep our heads above water. We were so busy with the twins and with packing up our rental home and preparing for the move back to Richmond. One evening we decided to take the kids and the dogs out for a walk in our neighborhood. After we turned our usual corner, Niles yelped out in pain. We didn’t know what was happening at the time, only that our powerful and resilient dog was suddenly unable to walk. My mom took him back to Richmond to our vet and he was diagnosed with a tumor and underwent his first surgery. Dr. Anthony removed what he could but told us it was more extensive than he first thought. He told us to keep a close eye on the area. You would never know Niles had surgery- he was groggy for just a few days but then went right back to leaping the fence and running in the yard after squirrels with his sister. In February we felt a new lump in the same area and so we returned to his vet and were referred to Dr. Waite at Dogwood Veterinary. Niles underwent a second surgery, his second in 8 months, and this one was more extensive. He recovered very well and after conferring with the radiologist in NOVA and Dr. Waite, Niles started metronomic chemotherapy in March. His response has been unbelievable! His tumor has continued to shrink every month and now Dr. Waite can hardly feel it! He has had no side effects to the medications and there is virtually zero change in his behavior. He is just as feisty, spirited, and carefree as ever. It has been a miracle for Niles and for us.